Giving Hope Lawn Management is proud to serve the community of Mechanicsville with professional lawn care and landscaping services. For more information or to get a free quote call us today at 804-839-8340. It’s likely that you can find auto services in Mechanicsville, VA. But what about when you need local landscaping services for your outdoor spaces? 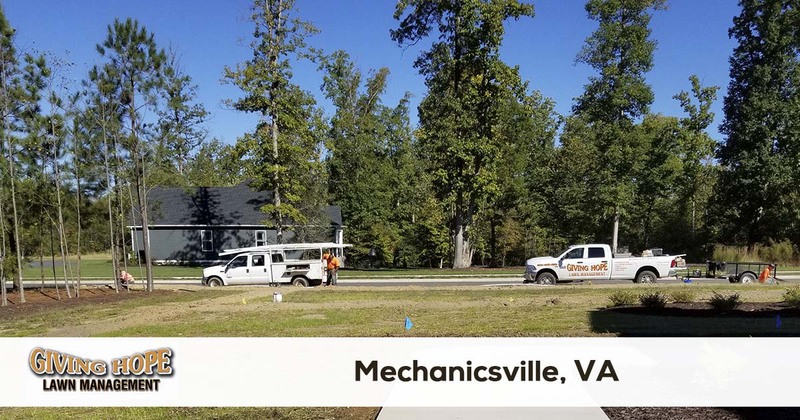 Whether you’re concerned about your home’s lawns or your company’s curb appeal, you need a reliable choice in Mechanicsville lawn care. And since 2011, there’s been one name that more residents turn to each time. Giving Hope Lawn Management offers complete lawn care and yard construction services. We can complete any project you have, from new irrigation systems to complete yard makeovers. Whether you need a quality option in monthly landscaping maintenance or you just need to know you’re getting the best value around, you need us for your lawns! No one else achieves your perfect yard like our team. Call today for the affordable choice in complete lawn care services. We get the results that no one else can! What makes us different is that we bring top-quality service to more area communities at the lowest price possible. Whenever you need to know you’re getting the best results at affordable rates, you can always rely on us! No job is too complicated for us. Whether your lot needs rough grading, or you just need to know your plants get watered correctly, we handle it all! Call now for your best yard care solutions. We have the affordable answer to all your landscaping concerns! If you’re tired of brown grass and expensive landscapers, then it’s time to call our team. We guarantee only the best results possible that won’t break the bank! Giving Hope Lawn Management is the industry leader for lawn care and landscaping in Mechanicsville. We offer a 100% satisfaction guarantee with all of our services, so there is no risk for you to give us a try. Give us a call today for the fastest service at 804-839-8340.